This morning's red post collection includes the Evolving the Meaning of Splash Art article, the 5.17 patch rundown, discussion on the Mordekaiser and Zyra plant PBE changes, the announcement of the 2015 All-Star event, another round of ask.fm responses, and much more! 9/1 PBE Update: Championship Kalista, Championship Ward Skin, Names on Scoreboard, and more! That’s how players described the reimagined Malphite splash art, which saw the hulking horned creature barreling toward Helmet Bros futilely staging a defense. His old splash also depicted a solidly-built rock monster, but gave off an action figure toy vibe too—like your dog might pluck him out of the drawing to bury him in the yard. The new version of the Shard of the Monolith would have Fido running scared, tail between his legs. The positive reaction from players was a fist bump to the illustration team’s evolving approach around League splashes, the culmination of an 18-month journey challenging their assumptions around what splashes should accomplish. The team’s goal became using splash to tell strong, fantasy-driven stories of champs for players, building windows into League’s IP. 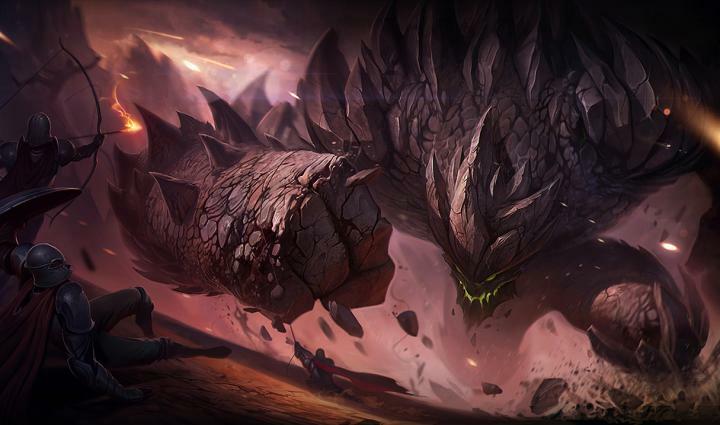 Malphite’s splash, unleashed in spring of 2014, was the planting of a flag. 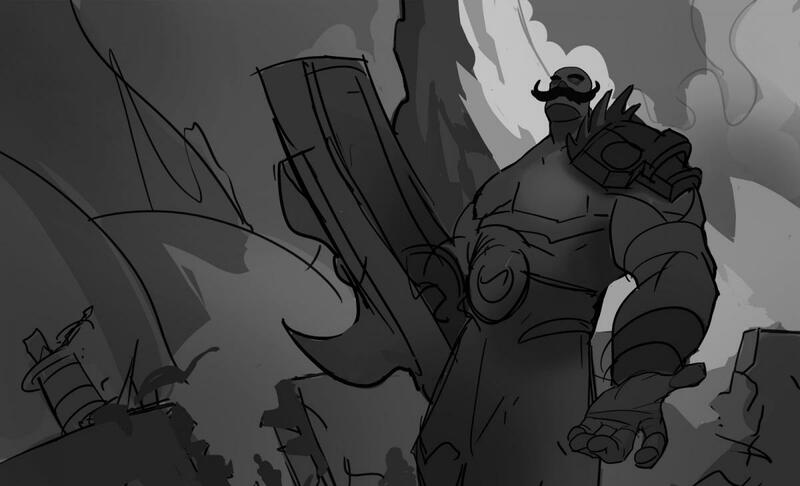 The old Malphite splash art from 2009. Splash art's been part of League since launching in 2009. Back then, the illustrations drew inspiration from character select screens in classic fighting games, the kind you’d see in the Street Fighter and Mortal Kombat series. Fighting game rosters could hit 50 characters, all tightly packed into an array of thumbnail portraits. Only by hovering over the thumbnail could you get a fuller look at the fighter. League splashes played a similar functional role, communicating to players exactly what champ or skin they were about to choose. The game started with just over 40 champs, before adding another 24 in 2010. 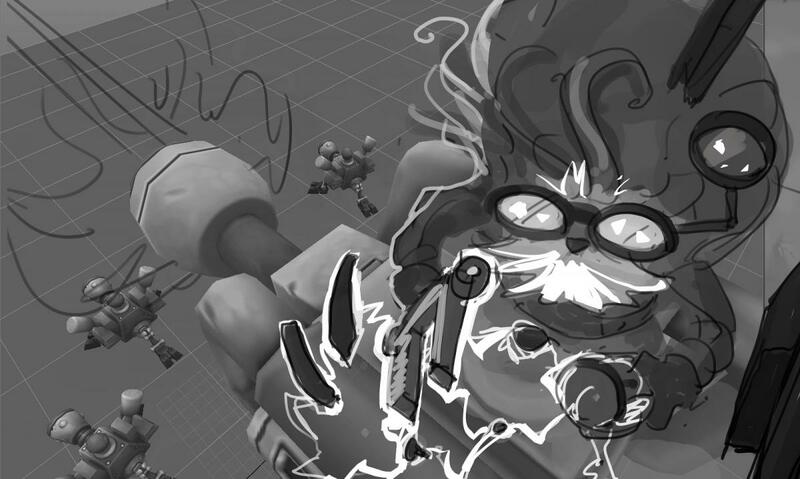 Splashes helped players decide which champs to play, and the team drew up a set of rules for creating a cohesive feel for League splash art. Andrew Silver, who leads the illustration team, recalls “aspirational” as a major buzzword the team often threw around. Champs always held either “heroic” or “action” poses back then, with viewers always looking upward at them. Their source of power had to be prominently displayed, and their abilities looked as they would in game. Essentially, splashes were near-literal translations of the in-game experience, because that’s what the illustration team assumed players wanted. But while the splashes technically rocked, the player response didn’t pan out as the team had expected. Take Elise, the Spider Queen, who dispatches exploding spiderlings at enemies before ambushing them from above. Upon release, she had two splashes. One, for the Death Blossom Elise skin, showed the champion dramatically mid-attack in a storm of action, fitting the conventional rules of splash. By comparison, her base splash appeared muted with her simply seated on a throne, patiently looking out—yet this marked a major departure for the team. “There were actual debates asking questions like, ‘If she’s sitting down, can she really be aspirational to players?’” recalls Silver. But when players saw the two, they preferred the base splash, taking the illustration team by surprise. The illustration team realized maybe their rules needed a rework. Silver thinks the base splash received a more enthusiastic response because Elise’s posture represents her regal nature as a queen. “Why does a queen have to get her hands dirty with killing me?” he asks. “The viewer’s already dead—they just don’t know it yet.” The split response to Elise’s splashes drove home that viewing the in-game model as the starting point for splash was too limited. The team began to understand the champion as something more diverse than that: “Yes, the model was an important factor in the identity of a champion for players,” says Silver, “but their perception of a champion is an amalgamation of all content we create." This returns us to Malphite. 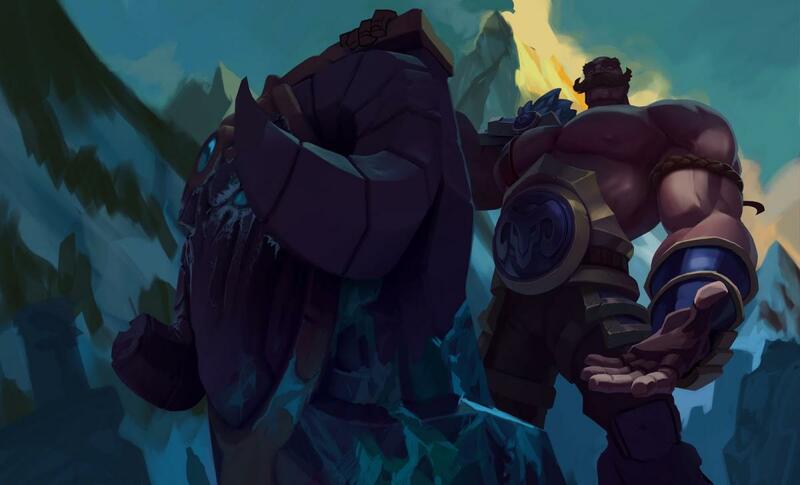 Initially, the new splash caused hesitation within the team because of how far it departed from in-game, especially since Malphite is one of the smaller models in League. How could they then show him 8-stories tall? The team worried that players might freak out: maybe representing the model was key to maintaining the fantasy. But, in the end, the response proved they could trust their gut. 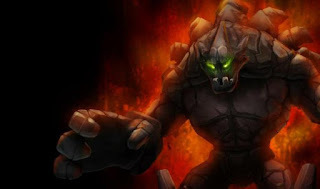 “While we create Malphite in-game to fit inside the gameplay space,” says Silver, “Malphite’s core thematic is the unstoppable force—we need to be able to understand the reason for him being unstoppable.” Turns out that’s pretty badass. To nail the core of Heimerdinger — something like a fine blend of Nikola Tesla and a cyborg Doc Brown — the team examined how a mad inventor would likely react in a scrap. What else would an inventor do but assemble things even while in battle? 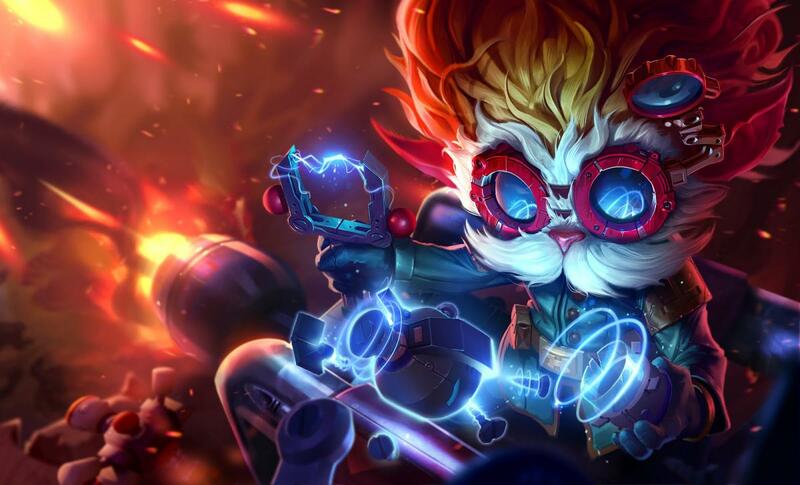 “Heimerdinger doesn’t need to be looking at the battlefield to know that the fight is going the way he wants it to go,” says Silver." With patch 5.17 out on live, join Scarizard and friends for the latest patch rundown! "Scarizard, Zirene, Jag and Counter Logic Gaming’s ZionSpartan tackle 5.17’s biggest changes in today’s rundown. Tune in to learn about balance changes to Maokai, Fizz, Kalista and more as they break down the patch… before the world’s patch." As you've likely seen, the 9/2 PBE update including oodles of changes to Mordekaiser W including the ability to self cast it and the addition of a health cost. "This set of changes is what we are testing internally at present, and might very well be all we do for 5.18. I do anticipate them being a buff to solokaiser -- It's hard to not generate net health from W (despite the hp cost), and if you hit your lane opponent it's a sizeable heal (half an hp potion at rank 1). These changes alone are probably not enough for his solo lane to be balanced, but I'd like to see where it leaves him when played duo/jungle. It's frustrating to have your favorite champion not quickly brought to viability. It's more frustrating to be put on a buff/nerf roller coaster. Also, this is the patch worlds will be played on, so I'm trying to be cautious (not my forte)." "The intent is for this to be a sizeable nerf to duo lane Mordekaiser (the damage zones can no longer overlap for double damage). This is almost certainly a buff to solo lane/jungle Morde, but not enough to get him fully to viability. It's more likely than not that he'll receive further changes in 5.19." I don't know how many times I have seen other people ban the wrong champion by accident, or done it myself. It's not hard to misclick, especially when the League window pops up over all other windows when it's your turn to ban. Giving the ability to lock in bans after you click it would solve this 99% of the time. Yea man, you can! We like this idea and it is planned... soonTM"
5.18 won't include a new champion. Even if it did I imagine we'd disable that champion for Worlds. "Plants should now consistently target Zyra's most recent auto attack target, rather than sometimes attacking things Zyra had attacked previously. They'll also interact a bit better with FoW and should be a bit more responsive around their facing/tracking of targets. Might be some other more subtle stuff, can't recall off the top of the head. Got a playtest in on the AI changes yesterday and they felt reasonable to me (I play a moderate amount of Zyra). Nothing that felt dramatically different, so not sure if I'd have known the changes were there if I hadn't been told, did feel like there weren't the moment or two of plants being unresponsive I'd normally notice in a game though." "We're fixing bugs with her plant AI as well -- the kind that lead to plants idling enemies nearby or continuing to attacking a unit when she had basic attacked another. The buff to Zyra's ult is to solidify her role as a potent counter-engage champion. If you dive into Zyra's team, you'd better be extremely fast acting or you're liable to be CC'd for 3.25 seconds. SmashGizmo's in charge of the change, but I think it matches her strategic identity well." Plants will quickly move to face the target they are going to attack next, so you can get a better sense for how your actions shape their priorities." "This is a buff to both solo lane and duo lane Zyra. Gold agnostic power is still power... if you want to play her mid, go for it! No reason to be spiteful over a buff that helps her in both situations. We continue to think that Zyra should feel like a supportive midlane pick (high CC within role) and a mage-like support (high damage within role)." "Back in 5.12 we buffed both Braum's mana cost and damage on Q. He's now looking a bit strong, so we're pulling back on the Q buff (restoring the cost to its pre 5.12 values)." We also have a a few more bits of discussion from Lyte's ask.fm! [Link] Will normal blind pick ever be disabled in favor of team builder? If everyone was actually using team builder then the issue of queue times for it wouldn't exist, and I think that's who so many don't play it. Even if you just disabled blind pick for the weekend, it would get more people used to TB.. The new Team Builder Draft experience is a brand new Champion Select experience, and one we believe fixes most of the issues players had with the original Team Builder experience such as matchmaking quality, queue times, and Champ Select toxicity. In the new experience, players will have to choose 2 positions (such as Mid/Top, or Top/Jungle), and we're introducing the "Fill" position for players who like to just play anything a team needs. We're also introducing small rewards for playing the high demand positions such as "Fill." Once you've chosen your positions, we send you into a new Champ Select lobby experience to do blind pick or drafting, then get sent to loading screen. We've made a few upgrades to the Champ Select lobby experience as well and will be discussing these changes more in the near future. We've been doing a lot of internal testing where we bring players into Riot HQ to test the new experience out and feedback has been super positive; so, if this continues when we launch to PBE, we'd love to replace some of the older queue experiences. [Link] Do you oppose the idea of allowing those who received 14 day bans, but have reformed and have not received any restrictions, to get season rewards? Not opposed to the idea; however, it's important to figure out how much "time" has to pass before a player is considered reformed. For example, if you say something racist, does 5 days of neutral play count as reform? Or does 10? Choosing the right numbers is critical. Generally, a neutral player might be pretty quiet and keep to themselves. They might only use Smart Pings to communicate about objectives, but don't really talk much otherwise. A positive player might actively rally their team, or give some team instructions to gather for a team fight, or be the positive force that diffuses any arguments between two players with things like, "Hey, let's just focus on the next fight." [Link] Why do you put so much effort into language rather than behavior? I've literally never been bothered by anything other than slurs and easily mute people. But supports that don't ward/break CS, junglers that dive turrets 2 or 3 levels below their enemy...these are far more annoying to play with. When we look at player behavior in League of Legends, we break it down into two categories: verbal toxicity (such as verbal abuse and hate speech) and gameplay toxicity (such as intentional feeding or leaving). It turns out that the majority of players rate verbal toxicity as more impactful than gameplay toxicity or equal impact. Of course, some players also believe that gameplay toxicity is worse than verbal toxicity. Because of this, we decided to focus our initial efforts on verbal toxicity for the first year and developed features such as the "All Chat Filter", Chat Restrictions and the Instant Feedback System. However, there's no silver bullet to solving player behavior so we always knew that we'd had to pivot and spend some time tackling gameplay toxicity as well. In the past year, we've launched the new LeaverBuster system which dramatically reduced leavers/AFKs in the game (although we generally see an uptick in leavers/AFKs close to the end of a Ranked Season in Ranked Mode), and we're going to soon be doing a global launch of the new Intentional Feeder Detection system which will target intentional feeders and ban them 5-15 minutes after a game. So while you aren't bothered by hate speech and slurs, the majority of players are. But, we do want to solve both types of toxicity and LeaverBuster and the Intentional Feeder Detection are steps towards reducing gameplay toxicity. [Link] Why does everyone have a 45-55% win rate? Is there a system that "balance" our winrate so we cant win more than lose? Once in awhile, we'll hear players say that the matchmaking system arbitrarily tries to make you lose if you're on a win streak, or intentionally tries to make everyone a 50% win rate. To understand how a matchmaker works, you have to first understand the theory behind matchmaking. A perfect matchmaker does not necessarily ensure that every single player in the game has a 50% win rate. In fact, a perfect matchmaker has perfect predictability--this means that for every single match, no matter who we put on either team, we can perfectly predict who will win the match, and what the odds of winning are. For competitive queues, fairness is critical, so matchmaking will try to make every match as close to a 50% win chance as possible. This means that when you win matches, your MMR goes up, and you face tougher and tougher opponents (which means eventually, when you reach your true MMR potential, you'll start losing about half your matches and winning half your matches). When you lose matches, your MMR goes down, and you face weaker opponents until you start winning your matches. So if a player is smurfing, they are playing matches against much lower skilled players and will win a lot of matches in a row and be on a win streak. Their MMR will increase dramatically, and they'll face tougher and tougher opponents until they are at their true MMR level, and will start losing a lot more games until their win percentage stabilizes around 50% (because their MMR gains have stabilized, not because the system forced a 50% win rate on them). So, there's no features or systems that intentionally forces players to have a 50% win rate, it just so happens that in competitive queues where fairness is the key for every patch, players stabilize around 50% win rate when they settle on their true MMR. We also have more ask.fm responses from Ququroon, a member of a the Champion Update team! [Link] Was the Fiora VU necessary? I've started playing her quite a lot and I have to say her new gameplay is fantastic (don't nerf pls). One thing that bothers me though is that stupid walk that simply doesn't fit her at all. Any chance they could change it into something less... ridiculous? Well, nothing is necessary, but I suppose that isn't a good answer. Glad to hear you like her new gameplay. We had her kit in a finished state for a little bit, and wanted to find a time to ship it out. Since it had a bunch of visual changes that were needed to support the gameplay (basically a full VFX set and a need for animations), we went ahead and grouped in the model/rig/animation changes with it. Fiora had her share of problems before, biggest one being that her silhouette was really weak, which was the largest push for updating her model. Her thematic identity was a little weak too, kinda just being... chick with sword. We didn't aim to destroy who she was, just increase the fidelity. We had an opportunity, and we took it. Hopefully you enjoy it on the whole. Our aim with her animation set was to increase the dynamics and expressiveness as she's moving about- this is something you'll see in general if you compare older animations to newer ones. (This is a good link to check out on that: http://the12principles.tumblr.com/)However, perhaps her run is just overdone. I can talk to her animator tomorrow and pass on your feedback. [Link] To continue asking about poppy's VU and rework, I am very anxious for it and would love some insight on when you think it might come out? She is my favorite champion of all time my very first champion ever and currently the only rank 5 mastery one I have can I please get a guesstimate if anything? Be sure to let me know what you think when you see her, yeah? [Link] I honestly don't plan on ever playing Cass or Skarner again after their reworks (I own Battlecast Skarner). The games ignore champ identity in exchange for something forced on that feels like Riot just wanted such and such in the game. Why is Riot so unwilling to rethink radical changes to champs? Let's hold on the two specifics for a sec, if that's alright. I'd like to go into the mindset of why we update when we do. First off, no change will make 100% of people happy. It's a sad reality, but true. People have preferences, and attempting to appeal to everyone will result in a poor product. That's not an excuse, mind you. We make efforts not to alienate players, and we make mistakes at times. We constantly have retrospective looks at updates we've shipped, identifying what we could have improved, what we did well, etc. If a change is actionable, we'll implement it past ship; but at some point we need to continue onto the next project, and after that and so on. A large reason for larger changes to champions is when they live in a realm of unbalanceable. Certain characters are just unable to be balanced- they're either completely OP or completely UP, it has nothing to do with numbers. As I -roughly- understand it, Cassiopeia was difficult because her DoTs were incredibly hard to appreciate even when drastically overpowered. For Skarner, he lived in a weird space where you'd usually want to pick another tank over him, especially since most of his power lives in his ultimate. I can't fully speak to Cass (not enough context), but for Skarner, we tried to add to his design. He still has his monstrous pick potential with his ultimate (to the fear of ADCs), but now has the added spice of the spires to augment his jungling experience. His gameplay has changed, but his identity should be similar? I'm truly sorry to hear that you're not a fan of the new reworks. We'll continue to tune them now that they have balance levers, so hopefully we can find a happy medium between what you knew, and what they've become. If you want more context on design, I'd suggest reasking the question towards ‎@RiotGhostcrawler. He knows a lot more in that area than I do. [Link] Even with the texture update, I feel like Swain needs some help. Thoughts? Agree. His model is on the weaker side, his animations are rigid, and his kit is kinda all over the place. With him being a GIANT BIRD DEMON and all, there's a good amount of things we could do. You can and you should expect an Evelynn update. She's a bit lower on priority because she's somewhat cobbled a bit of an update together over time. Kit, VFX, animation, and most recently her textures, have all been updated over the years. Not the best, sure, but it still puts her ahead of the worst of the worsts. However, c'mon man. She would be so much cooler if her theme was fleshed out. [Link] hey what are your thoughts on Kennen? will he receive a rework, or at least a VU?? Nothing currently slated, but yeah, he could probably do with both. Bump him up to the new Yordle proportions (KNEES), give him a bit more dynamic of a silhouette, play up his animations and VFX a good amount... Yeah. That'd be pretty sweet. Next up is the announcement of the the 2015 All-Star event taking place this December in Los Angeles, CA! "After the confetti descends at the 2015 World Championship, we’ll head into the offseason with players around the world setting their sights on our last international event of the year. The 2015 All-Star Event (ASE) will bring the unexpected to the Rift featuring a clash of the regions, epic 1v1 matches, fan-voted comps, fun game modes, and mixed region roster showdown. As we announced earlier this year, we’re hosting two large-scale international tournaments outside of Worlds. Before Summer Split, there was the intense and competitive Mid-Season Invitational which hit Tallahassee in May. After Worlds, we’ll be hosting the All-Star Event, a new exhibition at the NA LCS Studio in Los Angeles from December 10-13. The ASE will bring beloved players from around the world together, all in a revamped “theatre-in-the-round” studio layout to accommodate more fans than ever before. Evolving from 2014’s All-Star voting format, fans will vote in five players to represent their regional "dream teams" for the NA LCS, EU LCS, LCK, LPL, and LMS this year. With IWC’s top team added to the mix, these six teams will be assigned to Team Fire or Team Ice based off their region’s performance at Worlds. The teams will battle for fame, fun, and player rewards for their region. Want to send Rush Hour or see Sneaky Bunny represent the NA LCS? Global voting will open in November and we’ll share more information about how to cast your votes when we get closer to the event. The International Wild Card teams will also be getting in on the ASE action, just as they participated in MSI and Worlds. Before the All-Star Event, there will be the first ever International Wild Card All-Star which will be held in Australia in November. The winners of this tournament will represent IWC at the ASE. We’ll share more details about this new event soon. We look forward to welcoming stars from Leagues around the world to Los Angeles in December to close out the year in style. Want to join us in the studio? We’ll be sharing ticket information in the coming weeks, so stay tuned."